Spring is in the air… I am so excited. I feel like the weather has been tempting me all Winter! It’s time to get outside or let the outside in a bit! Open up those windows and let the fresh air in. 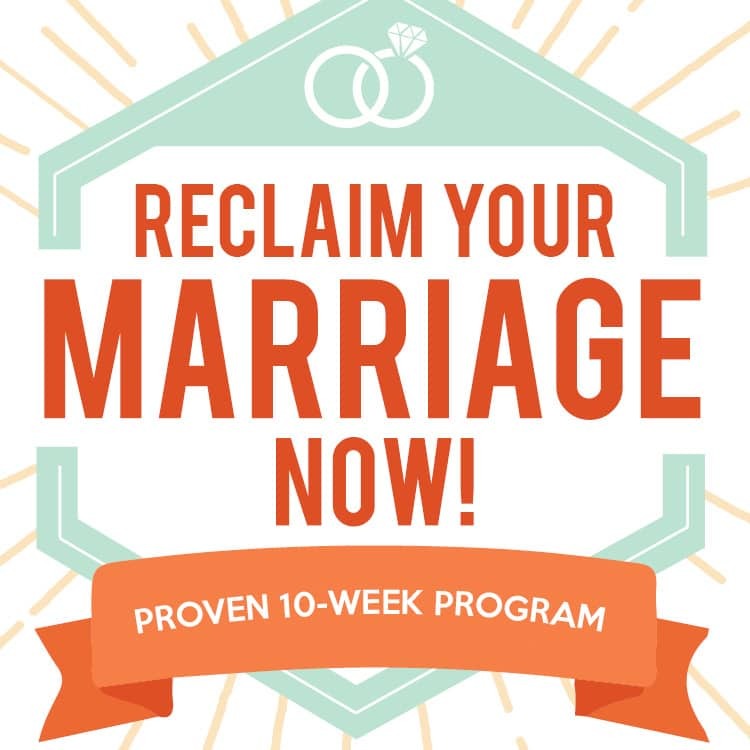 Breathe a huge sigh of relief! I might be outnumbered, but I love the motivation Spring gives me to tidy up the house and hit the reset button. 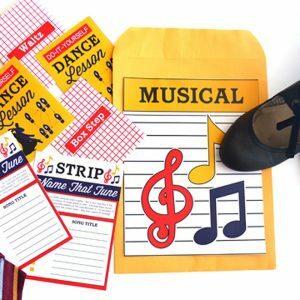 In an effort to embrace the freshness of Spring, we’ve rounded up some of the best Spring cleaning hacks out there to help you get the cleaning done and on to the fun!! 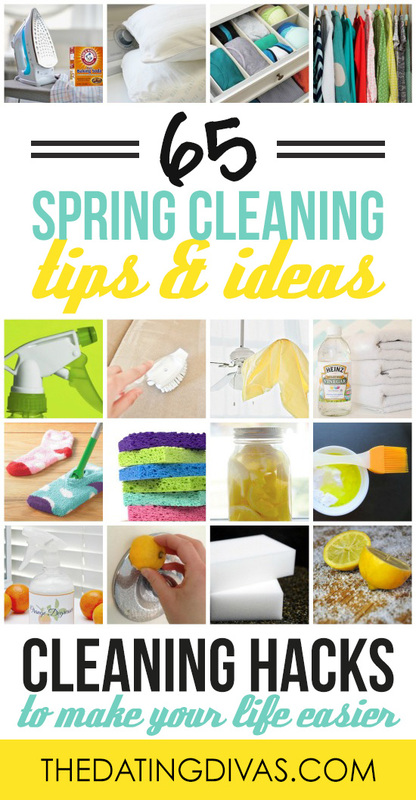 Believe me – these cleaning tips and ideas will change the way you approach your Spring Cleaning this year! Spring Cleaning can be overwhelming. I like to split up the work into manageable parts to accomplish each day or week. Let’s be realistic here! 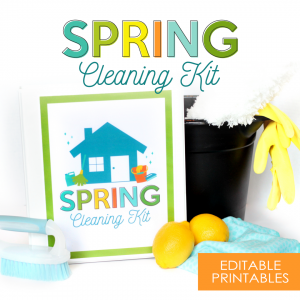 To help you stay even more organized, we created the Spring Cleaning Kit! Get your house clean in no time! Now, let’s work our way through the house! Now, this is my favorite room in the house, so I really want it to be nice, clean and organized! 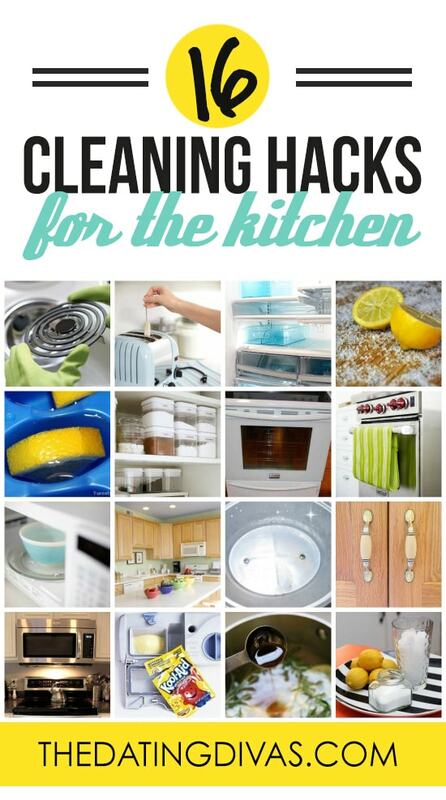 Here are some great cleaning tips to make the kitchen a little easier to master. 1. Toaster— Step by step instructions for how to clean your toaster quickly! 2. 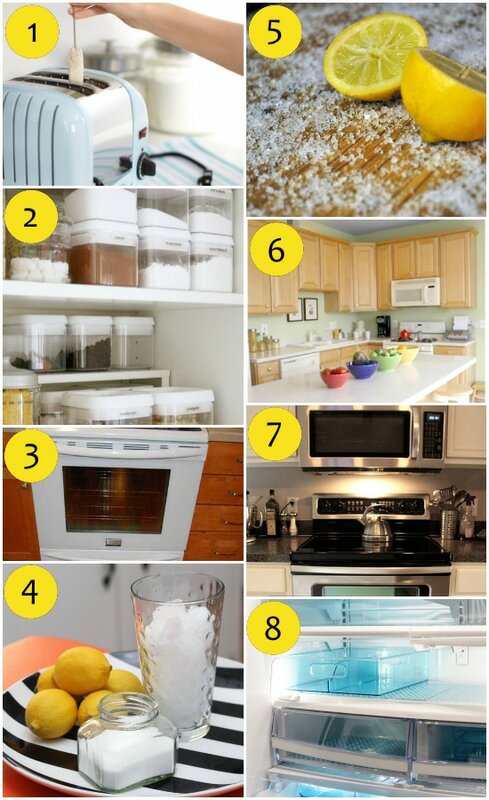 Kitchen Organization Tips— Some great storage tips to help you stay clean and organized. 4. Garbage Disposal— Sanitize and clean your sink with natural products. 5. Cutting Board— How to clean a cutting board the quick and easy way! 6. 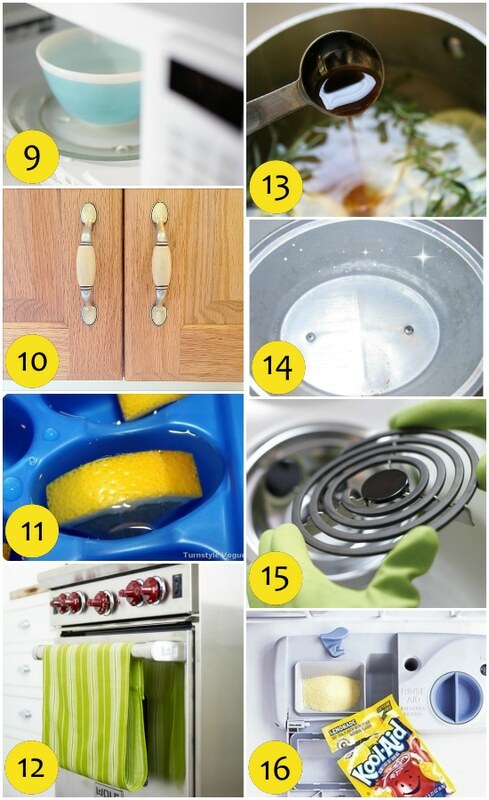 Deep Cleaning in the Kitchen— This deep cleaning guide will help get the cleaning done quicker! 7. Glass Cooktop— Tips for getting the stovetop shiny and clean! 8. The Fridge— Cleaning tips and tricks to keep your fridge clean & organized . 9. Microwave— Tips for cleaning the microwave, the easy way. 10. Cabinets— 2 ingredient kitchen cabinet gunk remover! 11. Shiny Sink— Get the sink shiny with natural products! 12. No Slip Dish Towels— A great way to add color, beauty and function to the kitchen. 13. Aroma— Fill your house with the aroma of spring! 14. Crockpot— Get that crockpot looking brand new with this trick! 15. Stove Top— How to clean those grimy stove tops. 16. Dishwasher— I’ll bet you haven’t seen this trick for cleaning your dishwasher before! When you have guests, this room is the first thing that they’ll see so it is really important. 17. Basic Cleaning Tips— How to clean up FAST. 18. Blinds— An easy way to keep the blinds dust free. 19. Baseboards— 6 ways to clean the baseboards. 20. Leather Couch— Clean leather like the pros. 21. Dusting Fans— If you have a fan, this is a must-read that will make your air cleaner and your life easier! 22. Microfiber Couch— Get those tricky spots off with this trick. 23. Add a little Green— I totally agree that a little green goes a long way to making a room feel fresh and clean! 24. Vacuuming— Are you vacuuming the right way? The bedroom is a room that you want to feel nice and cozy! So here are some excellent ideas for how to get and keep this room clean (long-term). 25. 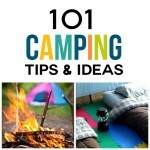 Clean Mattress— This post is packed FULL of information on how to deep clean your mattress. 26. Deep Clean Bedroom Checklist— Not sure where to start? 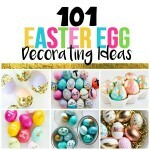 This checklist will definitely give you some ideas! 27. Cleaner Closet— Love the great tips from this post on organizing the closet. My husband and I definitely need to work on our closet! 28. 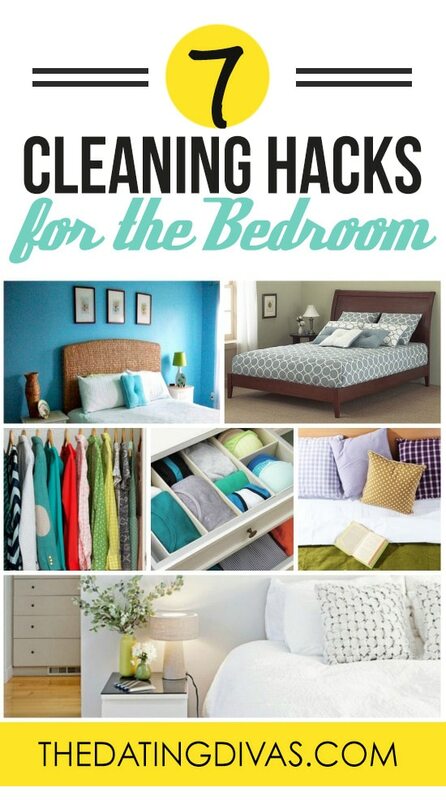 Cleaner Bedroom, Permanently— If you are taking the time to deep clean, you might want to implement these tips to keep it clean. 29. Dresser Organization— If your dresser is organized, it’s easy to keep it clean. 30. 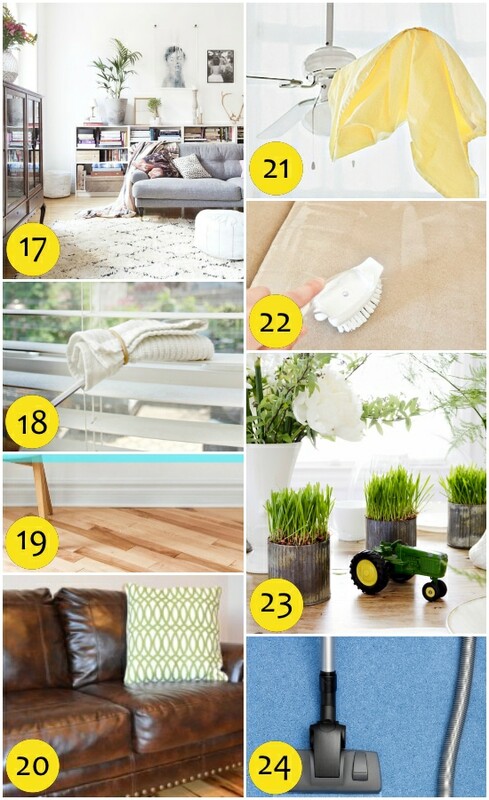 29 Steps to a Deep-Cleaned Bedroom— I had no idea there was so much involved in deep cleaning. 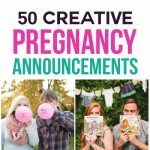 This list is thorough! 31. Change a Duvet Cover— Ever had a fight with a duvet cover? This will definitely help. BONUS. How To Wash Pillows— SideSleeperReviews has great information on keeping your pillows clean and caring for them! Everyone enjoys a nice and shiny bathroom! 32. 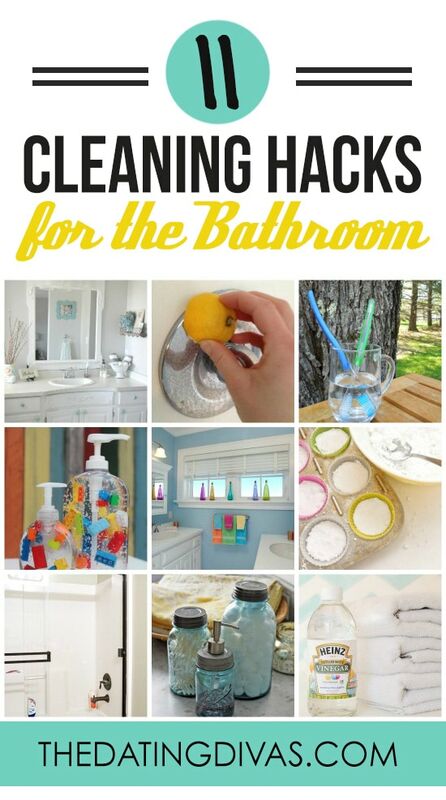 Clean Bathroom in under 30 Minutes— This is a how-to, broken down by the minute. 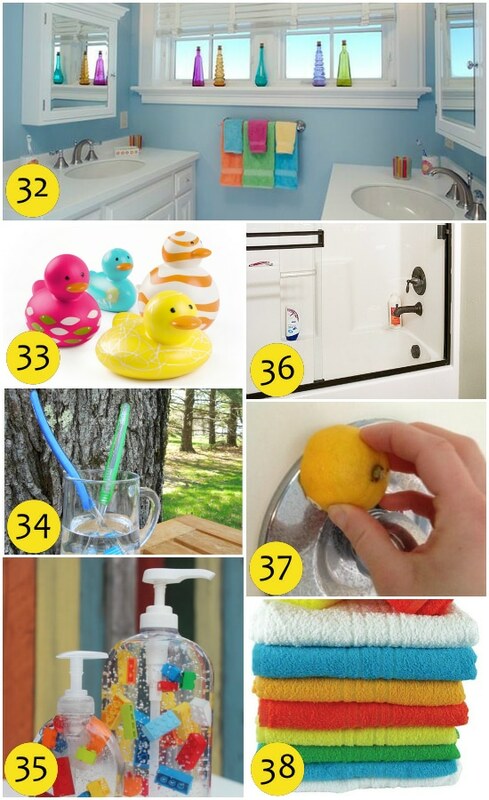 Clean the bathroom in under 30 minutes!! 33. 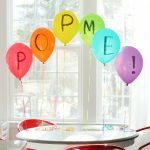 Clean Bath Toys— If you have kids with bath toys, you need to make sure that you are cleaning them, check out why and how! 34. Cleaning Toothbrushes— Clean your toothbrushes… tips for why and how! 35. Lego Soap— Brighten the bathroom and get your family excited to sanitize with this trick! 36. Glass Doors— A couple tricks to cleaning those tricky glass doors. 37. Remove Hard Water Stains— A natural way to make your faucet shine! 38. Make Old Towels like New— Do your towels need a makeover? 39. 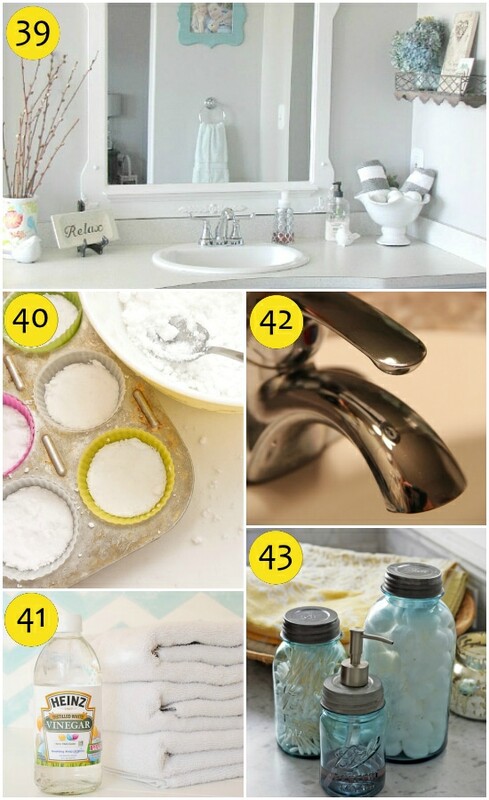 Deep Clean the Bathroom— This is a must-read, with a ton of great tips on tools and other essentials to help you get your bathroom really clean! 40. Toilet Bombs— These babies are perfect for unclogging and cleaning your toilet. 41. Freshen Towels— Get rid of the stink and make the towels smell clean. 42. Shiny Faucets— Another neat way to get some shine in the bathroom. 43. Vintage Mason Jars— These jars can be used for cute storage or soap dispensers! 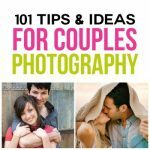 These tips are genius! 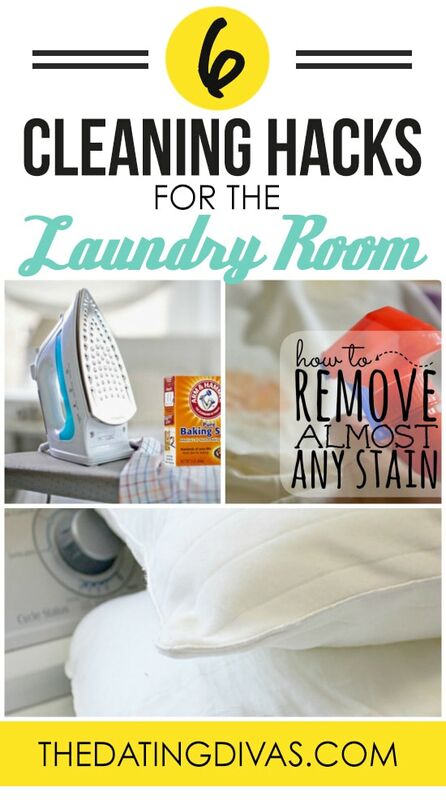 I had no idea that you should clean out your washing machine… Check out this quick and easy tutorial! 44. Clean Iron— This is one of those things that I would never even think to clean. But look how shiny it is. 45. Clean Your Washing Machine— This is a great tutorial on how to clean your washing machine. I didn’t even know that was important, but it is! 46. Whiten Pillows— Pillows should be washed twice a year, find out some more secrets to whitening your pillows! 47. Washing Kids Toys— A great way to clean the kids toys, I never would think to do this. 48. Baby Toys— A guide to washing every kind of baby toy! 49. Remove Almost Any Stain— Tips and solutions for cleaning the worst of stains. More and more people are becoming aware of how dangerous the chemicals in cleaners can be. 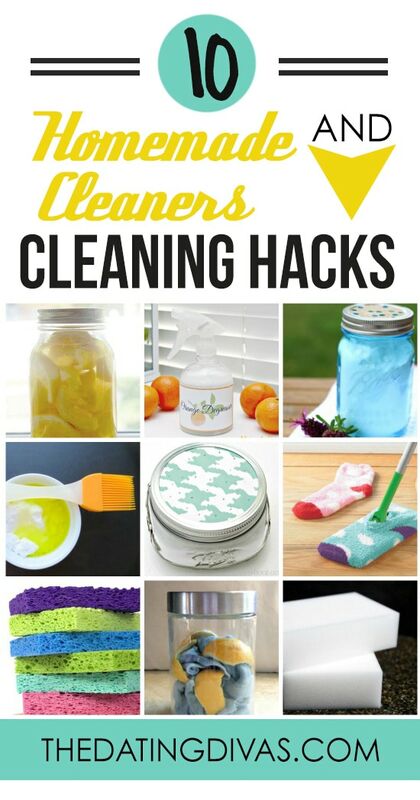 These are some great and super easy alternatives to cleaners that you can put together at home! 50. Sanitize Sponges— Do you hate sponges because they always seem to get so icky? 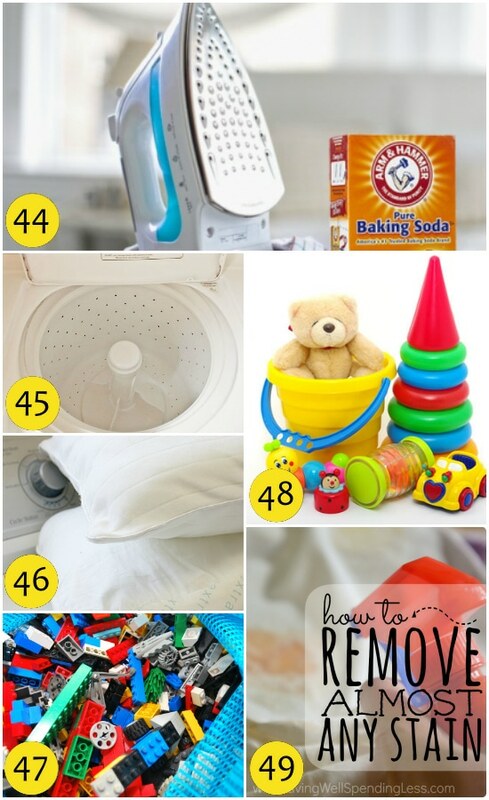 Learn how to sanitize them, plus 55 other tips for cleaning! 51. Recycling Socks— This is such a neat use for old socks and will help save a buck or two as well! 52. 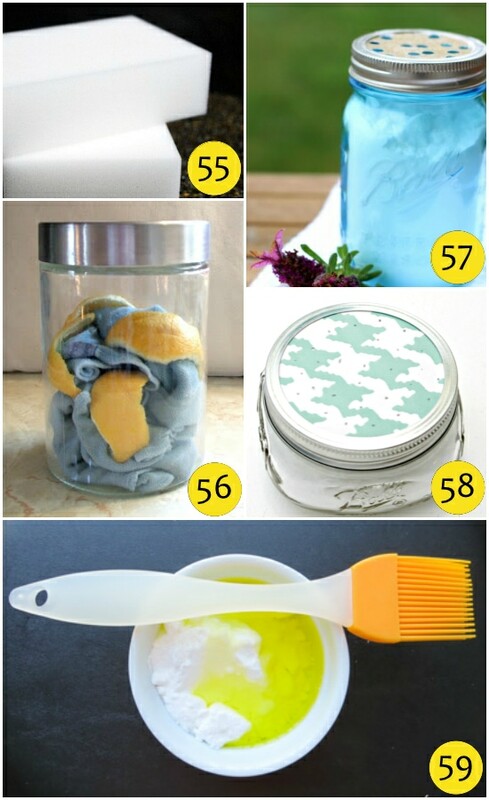 Lemon Peel— 25 ways to use lemon peel to help you clean! 53. DIY Floor Cleaner— Tips for cleaning wood and stone floors. 54. Orange Degreaser— Make cleaning tough, greasy spots a little easier! 55. Magic Erasers— Did you know you could make these magical things? 56. Lemon Dustcloths— This is so unique and has some great information on how to dust correctly so that you’re not inhaling the junk that you wipe off the furniture. 57. 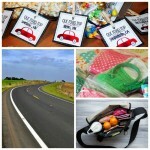 Carpet Deodorizer— Fast and easy homemade cleaner for your carpets! 58. Air Freshener— Love this idea for getting the air a little more fresh. 59. Homemade Soft Scrub— This is a favorite cleaner in the bathroom or kitchen or anywhere else, really! 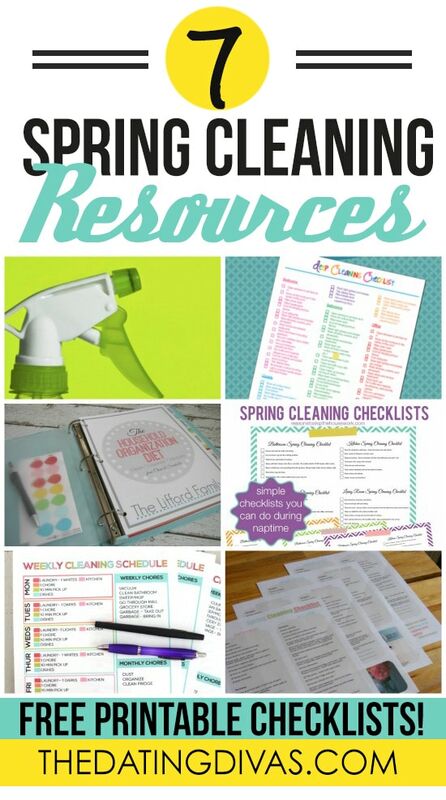 Now that you know some amazing cleaning tips, here are some great checklists and other resources to help get the job done. 60. 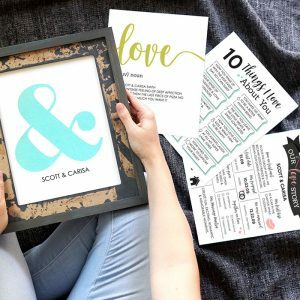 Create a Cleaning Binder— This shows you how to create a cleaning plan to help you get through the whole year. 61. Weekly Cleaning Schedule— Keep on top of it with this weekly cleaning schedule. 62. Deep Cleaning Checklist— The ultimate colorful checklist. 63. 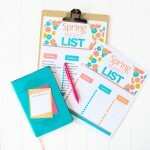 Spring Cleaning Checklists— Get your Spring cleaning done one room a day, during naptime! 64. 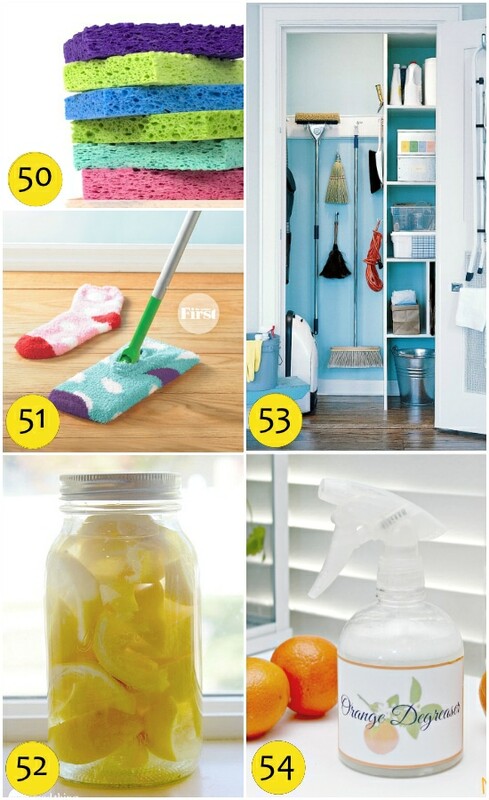 31 Spring Cleaning Tips— One task for each day. 65. Toss or Keep— Having trouble deciding what to keep or toss? Check out this flowchart. 66. Spring Cleaning Checklist— Break it down by room to make it easier. 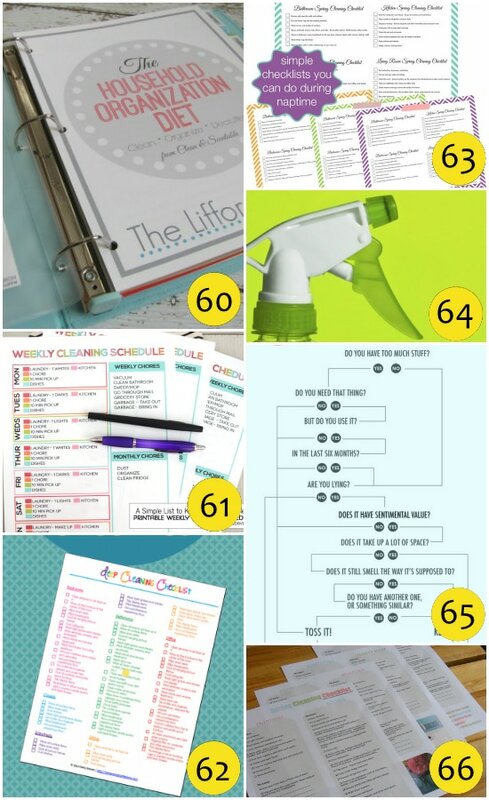 If you loved this post and are looking for even more ideas to help you get your house in order, you will definitely want to check out this post with 75 Ways to Organize Your Life. I really liked your tip to keep a weekly cleaning schedule. I’m a very scheduled person, so it’s difficult for me to just take the time to clean any of the rooms in my house without setting a specific time to clean it. That must be why there are some rooms in my house that are cleaner than other. Keeping a weekly cleaning schedule for each room in my house seems like an excellent way for me to take the time to clean. Wow, quite the list. Thanks for the dishwasher tip. Thanks! 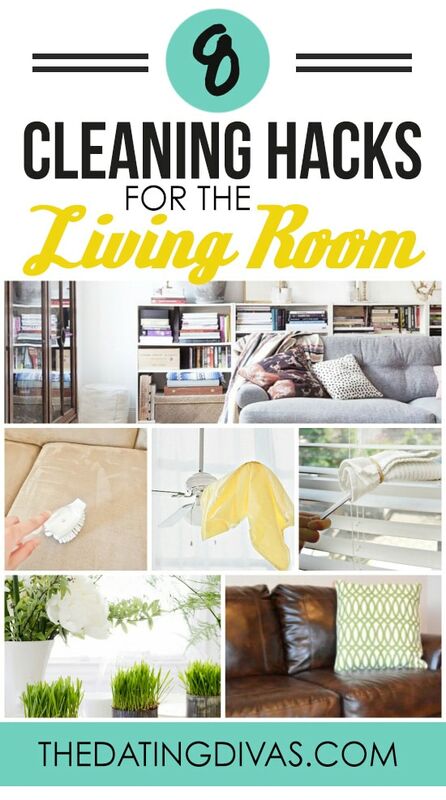 I’m a huge fan of making life a little easier, so I’m always looking for good cleaning tips! Good luck! Thanks Lindsay! 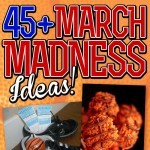 Hope you find the tips helpful!! Have a great day. Wow, what a huge list! 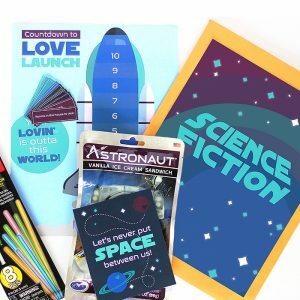 I’ll definitely be trying some of these this year. Especially the glass door in the oven, that’s one I’ve been struggling with for a while. Awesome!! Good luck with your cleaning list!